Marvel Adventures, formerly Marvel Age, was an imprint of Marvel Comics intended for younger audiences, including small children. Unlike the standard comics published by Marvel, which often take place in story arcs spanning several issues, each Marvel Adventures comic tells a standalone story. In April 2012 it was replaced by all new All Ages line tied to the Marvel Universe block on Disney XD. The Marvel Age's superheroes, based on the Marvel Comics' main canon's characters. Cover art of Marvel Adventures: The Avengers #1 (May 2006 Marvel Comics). Art by Aaron Lopresti. The idea was initially established as the Marvel Age imprint in 2003. The Marvel Age name had last been used as the title of a promotional magazine published by Marvel from 1983-1994. The initial idea for the imprint was to reuse the early plots, written by Stan Lee in the 1960s, in a modern-day setting, with new writers and artists retelling the stories. The stories would be published in the standard comic book format and quickly collected and reprinted in manga-style digest size. Several titles from Marvel's failed Tsunami line, as well as several other Marvel series, were also collected in this format and released under the Marvel Age banner. Each book also contained character concept sketches by the artists on the last pages. In 2005 Darwyn Cooke was brought on to develop a new all-ages book based on Marvel's heroes. 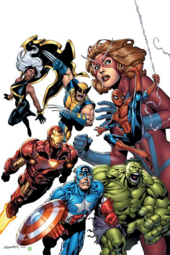 The stories would be independent from the Marvel 616 Universe and feature an array of Marvel's most popular characters. Cooke was eventually left behind by Marvel and the book carried on without him where a new batch of creators were brought on to tell stories Cooke never intended to tell. The Marvel Age imprint was relaunched as Marvel Adventures, with Marvel Age: Spider-Man and Marvel Age: Fantastic Four being restarted as Marvel Adventures: Spider-Man and Marvel Adventures: Fantastic Four. This time around, the stories would be original and not based on existing stories. In order to be able to tell standalone stories and to escape the trappings of having to reflect the events of other Marvel titles, none of the titles take place within the primary Marvel Universe continuity. Each title under the Marvel Adventures imprint seems to have its own continuity set apart from the other titles. In some instances, multiple continuities have even been used within single titles. The titles published consist of Marvel Adventures: The Avengers, Marvel Adventures: Spider-Man and Marvel Adventures: Super Heroes. Two other titles, Marvel Adventures: Iron Man and Marvel Adventures: Hulk, were both canceled after brief runs. Marvel Adventures: Fantastic Four ended its run, after 48 issues, in May, 2009. It was followed two months later by a Fantastic Four Giant-Size Adventures one-shot. In 2010, the line was ended and then rebooted with only two titles, Marvel Adventures: Spider-Man and Marvel Adventures: Super Heroes returning. Both titles started over with a new first issue. Both titles ended in March 2012, and were replaced by new titles tied to the "Marvel Universe" cartoon block on Disney XD, and are titled Ultimate Spider-Man Adventures and The Avengers: Earth's Mightiest Heroes Adventures, respectively. Marvel Digests were collections of Marvel Age/Adventures comic books compressed into smaller digest-sized books, rather than the original larger magazine form. Following theme with the Marvel Age comic books, they contained concept art sketches of characters in the back of the books. ^ "Cooke Gets Honest About "Before Watchmen," Turning Down Morrison". Comic Book Resources. April 9, 2015. This page was last edited on 21 June 2018, at 18:16 (UTC).